Saprolegnia is a fungal disease that afflicts fish. It is a serious condition, particularly for pond owners who have spent large sums on their fish, as there is no cure and the fatality rate is high among fish that catch it. It is a fungus which is classified under Oomycetes. It usually resembles a cotton wool which grows on the bodies of fish. 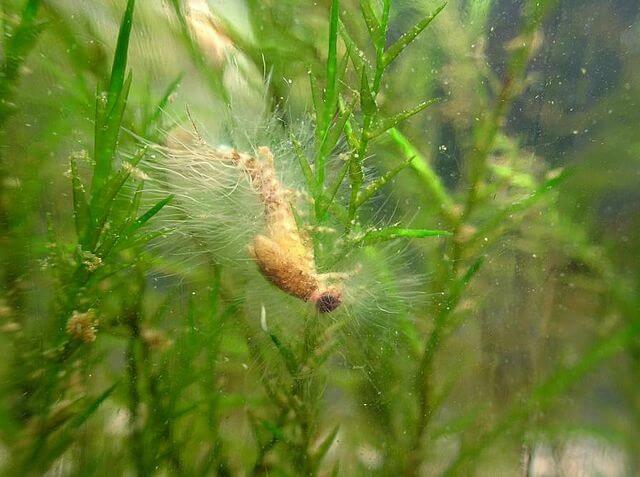 Among aquarium and pond enthusiasts it is the most commonly recognized fungus pathogen, and it is most often a saprophyte, which means that is usually consumes and thrives on animal or plant material which is decaying. Should its spores connect to living fish, the fish will usually be protected by substances within its mucous layer which stop germination. Unfortunately, if the fish has open wounds, the mucous layer will not provide the necessary protection, and the fungus will then enter, where it can then germinate and transmit special stems named hyphae. The hyphae will enter the skin of the fish and travel further into its tissue. Ultimately the fungus will release hyphae which bear special bodies called zoosporangia, and from them the spores will enter the pond or aquarium water. This can allow the pestilence to spread to other fish. The fungus will use the fish as a source of sustenance and will cause terrible damage while doing so. Finally the fish will succumb since the fungus damages the skin so extensively that the osmotic balance within the fish is completely unbalanced, which basically means the fish is unable to control its salt balance and bodily fluids. The gills will often be targeted, usually in the aftermath of gill disease, as the pathological changes which have occurred within the gills provide excellent lodging for fungal spores. This condition is extremely dangerous to fish as there is no cure once they are affected by it. Considering the thousands of dollars that some pond and aquarium owners spend on their fish, the consequences of this disease appearing can be disastrous. Therefore, the best solution is to prevent it from spreading in the first place. Every freshwater species of fish is vulnerable to Saprolegnia. The cotton wool fungus is quite distinctive and is typically associated with spots on the fish which have been damaged due to injury. One key method for preventing this disease is to keep pond water clean. Another good medication that has had some success is malachite green. Any hyphae which are found in the pond water should be removed, and the best way to do this is through swabbing the contaminated area with a solution that is 10 percent iodine and providone. Keeping the fish in a solution of salt can also present the function, as it will boost the osmotic balance that results from it. It is also essential for pond owners to reduce stress among their fish as much as possible so the condition is not exacerbated.